American Mystery Classics, 9781613161104, 264pp. The offices of foreign literature publisher and renowned stamp collector Donald Kirk are often host to strange activities, but the most recent occurrence---the murder of an unknown caller, found dead in an empty waiting room--is unlike any that has come before. Nobody, it seems, entered or exited the room, and yet the crime scene clearly has been manipulated, leaving everything in the room turned backwards and upside down. Stuck through the back of the corpse's shirt are two long spears--and a tangerine is missing from the fruit bowl. Enter amateur sleuth Ellery Queen, who arrives just in time to witness the discovery of the body, only to be immediately drawn into a complex case in which no clue is too minor or too glaring to warrant careful consideration. 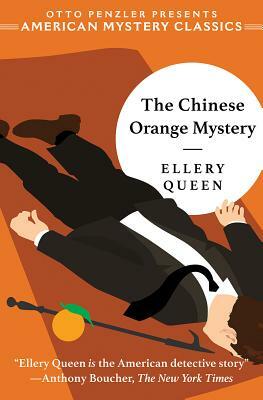 Reprinted for the first time in over thirty years, The Chinese Orange Mystery is revered to this day for its challenging conceit and inventive solution. The book is a "fair-play" mystery in which readers have all the clues needed to solve the crime. In 1981, the novel was selected as one of the top ten locked room mysteries of all time by a panel of mystery-world luminaries that included Julian Symons, Edward D. Hoch, Howard Haycraft, and Otto Penzler.